After a sluggish half hour, this well-crafted adventure kicks into high gear and never lets up. A veteran diver (Richard Roxburgh) is hired by a cocky, thrill-seeking financier (Ioan Gruffudd) to map an underground river through a network of spectacular caves and tunnels in Papua, New Guinea. But he hasn’t counted on working with his estranged son (Rhys Wakefield), an expert climber, and tempers flare in the close quarters as a cyclone raging aboveground interrupts communications with the surface crew. James Cameron served as executive producer, and the 3-D process he perfected for Avatar adds depth to the underwater scenes and texture to the subterranean settings (most of which were shot on a soundstage). Roxburgh invests his character with a harsh fatalism that echoes the screenplay's allusions to ancient Greek myths about Hades, patricide, and hubris. Alister Grierson directed. Whether you're in the mood for outdoor adventure movies at the Banff Film Festival, wanting a bird's eye view of marriage or gearing up for another movie where Jim Cameron tortures a group of actors, it's all at the movies. 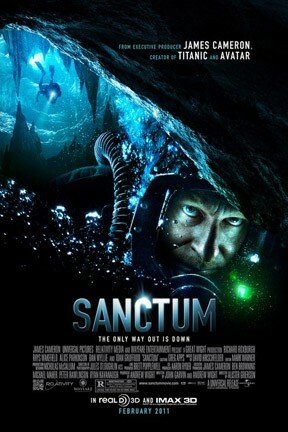 Sanctum 3D, Sanctum: An IMAX 3D Experience and Sanctum are not showing in any theaters in the area.